While on family vacation in Florida we had dinner at some sort of cave-man themed restaurant. Our booth sat back in a little personal mini cave. The most memorable part was when our waiter brought the menu. It was a 4 foot tall slab of fake rock that hung from the top edge of the entrance to our cave. I remember feeling a little panicked that we were now walled in. There was no escape from our booth until the waiter returned to take our orders. Does that tag of that tea bag have the skull and crossbones on it, or is it just me? Also, I think this week is just Biff being completely awesome, yet at the same time, completely Biff…y. Pirate Biff = extra serving of awesome. Ha! Pirate tea and a sugar chest. If I drank tea, I’d totally start drawing a skull & crossbones on them. If I had a sugar container for the table, a treasure chest would be awesome. @Tvae It looks like the skull & crossbones, but its hard to tell. If Biff puts that telescope down, does it leave a black ring around his eye? Biff tries to see Venus, but all he sees is Uranus. Both could be names of the other restaurants that he wants to order from. Sort of a “The Cask of Amontillado” kinda restaurant, eh, Chris? wall you in and laugh at you until you’ve been served your punishment… er, dinner. Bwahahahahahahaa! 2006 movie week: Monday: The Illusionist, Tuesday: Revenge of the Sith (though that was actually 2005), and today is Pirates of the Caribbean 2: Dead Man’s Chest. I know, I know…I’m over thinking it by a lot. Imagine: you are just having some nice lunch at a ramdon restaurant when suddenly dozens of pirates raid it to deliver food to some costumer at their own restaurant. When you look at that costumer, you realize he has enormous eyebrowns and extremely pale skin. You laugh your bottom out. Biff is lookin’ cute in his styling hat…I’m guessing he’s gotten a little “pirate-tea” since the movies. Heh heh hee! 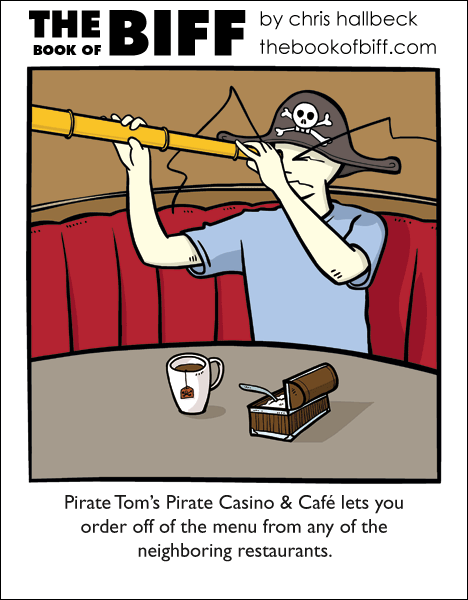 I’m suddenly tempted to buy the coffee shop two blocks away that’s closing and make a pirate-themed cafe. I daresay you’ve broken the code! @Micah – That’s the most plausible guess we’ve had yet, but man, if that’s it, Chris is getting crafty. what was the name of the resteraunt i live in florida and want to try it! Genius! I would have never guessed! Good detective work. You sneaky little person. The theme of the week is always like a game inside the comic. Sometime it’s easy, other times, like this time, it’s hard…. Another reason why I’m a faithful reader. The first rule of The Book of Biff is there is no Book of Biff. The second rule of The Book of Biff is there is no Book of Biff. And remember: if it’s your first reading, you have to guess themes! They take their Pirate theme seriously. At one point there was a week where spontaneously all the comics had a pizza in them somewhere. This was the first spontanious theme week. I don’t know eventulay these rare spontaneity theme weeks started to happen almost every week, and for the last while there has been one each week. How appropriate. You know how they get the food? They go raid enemy restaurants! Raise the flag high! @Grug – Correct! I usually have a little story like that for each comic. The trick is that I have to condense it into a single sentence. Chris – Just be glad the restaurant wasn’t a drive-in. When they brought the food, it might have flipped the car. I bet window seats cost extra. What would a ninja theme restaurant be like? @ Kenji: You’d have to find it, first. @ ZackDark: You also misspelled “eyebrows”. ARRR! We be raiding the Olive Garden for Sticks That Be Bread! I mean what could be more awesome than a restaurant that raids food from other kitchens? @Gato: Does the New York restaurant have the waiters in Japanese stagehand uniforms (stage-ninja costumes)? I’VE GOT IT! At the ninja restaurant, the menus are sent to you by the waiter, who is throwing them to you attached to knives. Your food is given to you via a secret trapdoor inside the table. Then, when its time for you to pay, the ninjas steal your wallet, take out the required amount, and return it on your way out. Sorry for the triple post, but I feel like his eyebrows should have little hooks on them. ‘cos not even Dr. McNinja is greater than NINJA BIFF!